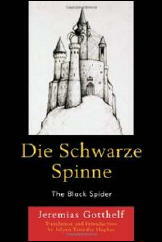 » Reviewed by Jonathan Lewis: JEREMIAS GOTTHELF – The Black Spider. 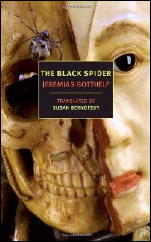 Reviewed by Jonathan Lewis: JEREMIAS GOTTHELF – The Black Spider. JEREMIAS GOTTHELF – The Black Spider. New York Review of Books, paperback, 2013. Translated by Susan Bernofsky. First published as in German as “Die schwarze Spinne” in 1842. When I first spotted a new copy of Jeremias Gotthelf’s The Black Spider in the science fiction/fantasy section of my favorite Washington D.C. bookstore, I confess that I wasn’t familiar with either the author or the book. My curiosity was piqued, so I decided to purchase the novella. I’m glad I did. 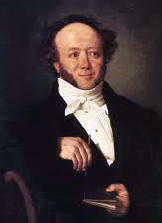 I read it over the course of several days, scribbling notes to myself on the margins, and I found myself eager to learn more about the life and times of Albert Bitzius (1797-1854), the Swiss pastor and novelist who, under the pen name of Jeremias Gotthelf, wrote one incredibly vivid and didactic horror tale. The Black Spider begins with a serene pastoral Swiss setting. A family and their friends have gathered for a child’s baptism. All seems well in the world. Then one member of the baptismal party notices something odd. There’s a black piece of wood in the old house’s window post that’s noticeably short and out of place. People are curious. What is this piece of wood doing there? As the old advertisement used to say, inquiring minds want to know. That’s when the action really takes off. The grandfather (unlike in Jack London’s The Scarlet Plague, we never learn his proper name) uses the piece of black wood as a jumping off point to tell a haunting tale about a castle, a brutal knight named Hans von Stoffeln of Swabia, oppressed peasants, and woman named Christine of Lindau who tries to outsmart the Devil. As if that weren’t enough, there’s also a sinister quasi-sentient demonic arthropod that wreaks all sorts of havoc and mayhem. The basics of the story are as follows. Some six hundred years ago, a cruel knight forces his peasants to relocate some beech trees in order to create a shady walk by his castle. They have no idea how they are going to complete such a physically demanding task. Enter a strange character, a huntsman dressed in green, with a red feather in his cap, and a red beard. It’s not too long before the reader learns that this huntsman has the stench of sulfur about him. Soon after, we learn that he’s the Devil. The aforementioned Christine makes an unholy bargain with him, one that would allow the villagers to be freed from the nearly insurmountable burden of planting the trees. The deal is sealed with a kiss on the cheek. But, as with all deals with the Devil, it comes at a steep price. In this case, the Devil wants the villagers to turn over a newborn child before it is baptized. After that, things get even weirder. The black spider comes to life and brings death. Eventually, a woman captures the spider and plugs it in a hole. There it rests for many years. Then, in an age of impiety and frivolity, the spider gets loose again. Only this time, there’s a man named Christen who, with divine assistance, is able to “thrust the spider into the ancient hole.” (p. 102). Here, the religious message of the work becomes increasingly apparent. Faith and honesty are good; “pride and vainglory” are bad (p. 105). And as far as the aforementioned piece of black wood, it gets incorporated into the frame of a newer house and keeps the black spider imprisoned, where it supposedly remains on the day when the grandfather tells the baptismal party this very creepy story. Early nineteenth-century Switzerland doesn’t immediately come to mind when one thinks of either Gothic fiction or what is best described as weird fiction. Lord Dunsany, Clark Ashton Smith, and H.P. Lovecraft were all twentieth-century writers and wrote their works in an increasingly secular world. Jeremias Gotthelf, by contrast, was a more devout man who wrote in an age more steeped in faith than the aforementioned purveyors of cosmic horror. His ultimate villain was the Devil, not some strange creature from beyond space and time. The Black Spider may very well be one of the first works of weird fiction ever written. For this reason, it’s well worth reading. But it’s also a good scary tale to read on an overcast day when it’s windy outside, the rain is hitting your windows, and you have some cabin fever. That’s what I did. And I loved every minute of it. You sold me, Jonathan; I’m a sucker for old “Deals with the Devil” stories! This is a great book, but horror dates back to the Gothic movement of the late 18th century and writers like Mrs. Radcliffe and Hugh Walpole who all wrote well before 1818 when Frankenstein came out. Bulwyr-Lytton had written The Haunted Brain, the Bronte’s were skirting the genre, Melmoth the Wanderer, Monk Lewis The Monk, William Ainsworth’s novels, Goethe’s Faustus, not to mention the bloody minded Tudors in Elizabeth I’s time, E.T.A. Hoffman, Potoki’s The Saragosa Manuscript, and even some of Poe predate this (Poe created the detective story in 1841). But this is a great book, too little known here, not unlike Ewer’s later novels in the genre. Thanks for the great review. Certainly this is one of the classics.